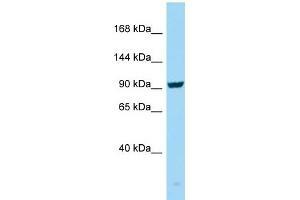 Characteristics This is a rabbit polyclonal antibody against SEZ6. It was validated on Western Blot. Background SEZ6 may play a role in cell-cell recognition and in neuronal membrane signaling. It seems to be important for the achievement of the necessary balance between dendrite elongation and branching during the elaboration of a complex dendritic arbor. SEZ6 is involved in the development of appropriate excitatory synaptic connectivity.